Speaking exclusively to RAIL in Cardiff, Talgo UK Director Jon Veitch said the company was not just targeting the HS2 train order in the UK. “The market for the UK and Ireland is really interesting. We are looking further afield than the East Midlands, West Coast Partnership and HS2 deals,” he said. 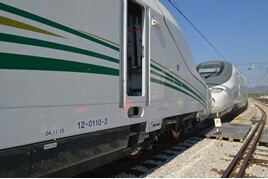 Veitch added that Talgo had also been interested in the CrossCountry franchise, until that competition was scrapped in September. “We are here to offer regional, inter-city, high-speed and very high-speed trains,” he told RAIL. The company also plans to enter the overhaul market, with Veitch saying it would offer a full turnkey project for any manufacturer’s product. For the FULL story on Talgo's UK factory location shortlist, read RAIL 864, published on October 24, and available now digitally on Android, iPad and Kindle. I think it’ll be a good opportunity for Talgo to manufacture new trains for HS2 when the HS2 rail line is completed in stages mid/late 2020s and early 2030s.